Relate: It was a Friday night and I was one sophomore among the hundreds of college students sitting on the side of a hill listening to a missionary from India. he made us laugh. He made us cry. Then he challenged us. Every year, every Friday night a different missionary would come and speak to us. Those evenings were amazing and inspiring and life altering. This was my church. Yes, I attended a local church on Sunday, but I never really felt plugged in there. I went to Nixa my sophomore year, Evangel Temple my junior year and Calvary Temple my senior year. Honestly, now that I think about it, I can’t even be sure that is accurate. I am thinking that it was CT that I went to when I returned to Springfield for a year in 2004, but what was the third church during my college years? They were all so underwhelming that I can’t even remember. But Friday nights most definitely were not. There are three things I truly miss from my college days: my classmates is third, my morning prayer times is second but neither of those comes close to those Friday night CMF (Campus Missions Fellowship) services. Anyways, back to that first Friday night. The speaker was challenging us to not just give an offering but to make a commitment to give every week. I pledged $5. I didn’t yet have a job and I was certainly not going to be getting any money from home, but I figured I could manage $5 a week. I could. I did. Every Friday I had that five. Sometimes I had to borrow it from a friend. Once I shaved someone’s head for $5. However I needed to manage, I did. Every week. Skip past summer to my junior year on that same hill. I was feeling good about being faithful the year before and felt I could reasonably up that pledge to $7. But then I felt God saying He wanted me to double it. OK, now You’re pushing it. I had managed a job last year for a whole two months. After my dad died I quit and I didn’t work the remainder of my sophomore year. I was promised a spot in the alumni office but it was only ten hours a week. $5 would be about a tithe. $7 would be a sacrifice. $10, if that happened, would be nothing short of a miracle. With much fear and trepidation I made the pledge. Somehow, every Friday, I was putting a ten in the plate. He was faithful. Once again my senior year, I was sitting on that hill for the annual CMF bonfire. This year the same speaker was sharing who had spoken my sophomore year. Once again, I was feeling good about my giving for the past two years. I wanted to step out in faith and up that pledge to $12. But once again, I felt God telling me to double it. By this point I was working security. That was 18 hours a week 5.50 an hour. There were many times I was going down to the center on Thursday to give blood for research. They paid $20 for that so you could say I was literally giving my blood for missions. Every Friday, God was faithful and somehow the money was there. My college education was costing me roughly ten grand a semester all bills included. When I graduated I owed Uncle Sam 5.5 grand. I also owed my mom 3 grand. Beyond that, I was debt free. To this day I still have no idea how that happened. There was one time when I received a notice to be before the financial board at a certain time. I went into the daily chapel service expecting to be kicked out in just over an hour’s time. I owed 7,800 at that point and if I didn’t pay at least half of that I was done. In the mailbox after chapel I found a notice that I had been approved for a grant that I had applied for over a year ago and had forgotten completely about. That grant was $3,500 ahd the board said that was good enough for now. I did my best to stay faithful in the little and, God time and time again proved Himself faithful in the big. College taught me a huge lesson and I have never, not once, worried about money since. I just do what He’s called me to do and He will take care of the rest. React: The local church does not need our tithe. If they are following in obedience to God, He will provide. It might be through us, it might be in spite of us. On the flip side, if that church is not being wise stewards or is not walking in obedience to God’s calling then no amount of faithful tithers will ever be enough. No, the local church does not need our tithe, but we need to be giving our tithe to the local church. Tithing is not about giving the church money. Tithing is about giving God priority. If we are not willing to be obedient and surrendered to God in the area of our finances then we have absolutely no right at all to expect Him to bless us in any area of our lives. Tithing is not about finances, it is about Lordship. If Jesus is not Lord of our lives, dare we call Him Savior? Help me to live in a place of surrender. I am so thankful for the many ways both then, and in the time intervening, that You have proven Yourself faithful. Thank You for the ways You have demonstrated over and again that when You call, You provide. Forgive me for those times and areas of my life that have not been as surrendered to You. In my time, with my money, in my relationships, and with my efforts I give everything to You again. use it as You will. Pour me out that You might be glorified through every aspect of my life. Our faith *is* certainly about lordship, and it is about trusting in God for provision. But I would like to suggest that faithful tithing (rather than legalistic tithing) is precisely one of the ways in which God prompts us to show we surrender to His Lordship, and give the work of the kingdom priority above our own desires? I am curious how you are defining legalism here? The way I see it, obedience is never legalism. Maybe clumsy use of vocabulary on my part. I am thinking of financial giving specifically, in terms of “I will give 10% of my income, and that is all”, rather than the faithful giving of the widow of Luke 21, or the ‘reverse tithing’ of people like Rick Warren, whose response to their financial blessing is to give 90+%. Either case, I think, reflects a wider surrender to God, of which giving to the local church remains an important part? It’s really a minor point on a great post – and I hope underlines your main theme – the ‘tithe’ is about what God prompts us to give, not what the church ‘needs’. Thanks for this and all your other posts – a real blessing to me, and others I am sure. Thank you. Personally, I don’t think I have ever been consistently giving just ten percent. That is a baseline and a great place to learn to start a lifestyle of surrender, but most who have learned to be faithful in that will end up going beyond it in an expression of love. Obedience to the voice of God, is supreme. It brings great rewards. God’s kingdom is all about following him in intimate relationship. Beejai met the test and received abundant blessing and closer relationship with God. Great thoughts! I wrote a post on tithing if you’re interested: http://journeyoftheword.com/2015/02/24/should-christians-tithe/. The revelation about tithing sets one free from the love of money. I began to see that provision was made for me in ways I would have never dreamed by my Father who knew what I would need. My life is a testimony to His goodness and lavish generosity. So good!! We were just talking about this topic in our small group. It’s an act of obedience and like you mentioned, priorities. Thanks for sharing this. Something I’d like to clarify. Perhaps it wasn’t mentioned because you already know and think your readers will. 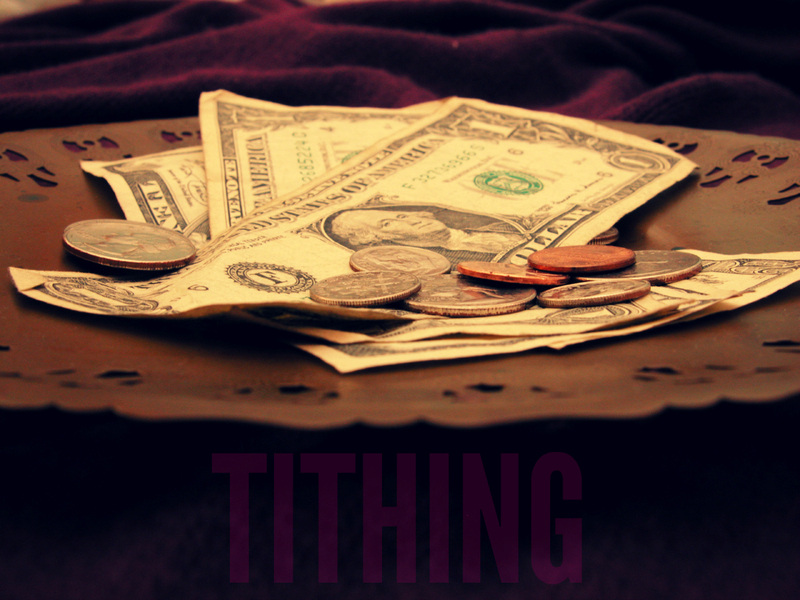 The word “tithe” means “tenth.” If you call it a tithe, it’s ten percent; otherwise, it’s an offering. I tithe – and give offerings – to my local church (God doesn’t have a checking account), but when I do so I consider that it is God to whom I am giving it. Like a gift, it is the recipient whose property it becomes. When I put it into His hands, I no longer worry about it. Not my job to determine how it is used – that’s God’s department. We don’t give to get, as some teach, but God DOES bless us as we are faithful to Him, and we have, like the Scripture (Luke 6:38) says, been blessed. This is a miracle, for before I gave myself to Christ money was my god. Yes. What we give is His tithe and our offerings. Is He Lord? Do we and all we have belong to Him? Then in faith we can give what He impresses us to give in tithe and offerings. We give what we feel led to give (or what we pledge/promise) through offerings. 16​ Now about the collection for the Lord’s people: Do what I told the Galatian churches to do. On the first day of every week, each one of you should set aside a sum of money in keeping with your income, saving it up, so that when I come no collections will have to be made. whoa really beautiful. Thank you for writing this. I’m learning each day not to worry but being someone who likes to plan n see all the roadwork way ahead that has been an uphill task but your testimony really encouraged me. Thanks for sharing. I love the last line. God is faithful. I just do what He’s called me to do and He will take care of the rest. What a stimulating and inspired sharing on the “tithe”, “offering”, or whatever we think it is. We give as God leads us and we trust that He is going to use it for His glorious purposes. Thank you Beejai and all the contributors for a lively discussion. This is fantastic! I was laughing each time God asked you to double your tithe. That’s totally how He works. 🙂 Awesome to see how He provides when we’re faithful in the little (well, and big).